During the Weimar Republic, the government had instituted a public day of mourning to commemorate the war dead. Under the National Socialists, this holiday was renamed “Heroes’ Remembrance Day” [Heldengedenktag]. The new name corresponded more closely with Nazi ideology – the emphasis was no longer on mourning and the avoidance of future wars but rather on heroes and the glory of the fallen. “Heroes’ Remembrance Day” was just one of many examples of the National Socialist glorification of the sacrifices made by soldiers. The holiday was always celebrated on the Sunday that fell five weeks before Easter. In 1935, “Heroes’ Remembrance Day” fell on March 17, the day after Hitler reintroduced military conscription. That year, the National Socialists made particularly good advantage of the festivities surrounding the holiday. 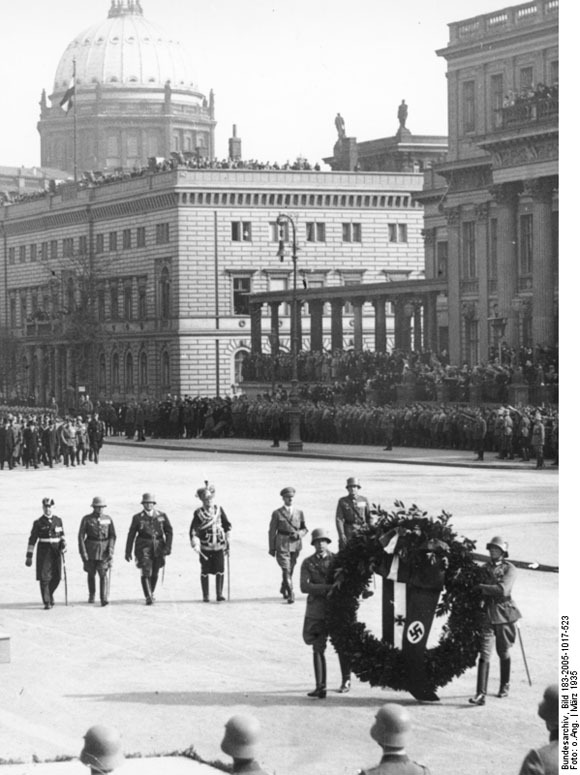 The photograph below was taken during a wreath-laying ceremony at the Heroes’ Memorial “Unter den Linden.” It shows (from left to right) Admiral Erich Raeder (Commander-in-Chief of the War Navy), Senior General Werner von Fritsch (Commander-in-Chief of the Army), Reich Marshal Hermann Göring (Commander-in-Chief of the Air Force), General Field Marshal August von Mackensen (Royal Prussian Army), Hitler, and Reich Minister of War Werner von Blomberg. Mackensen was the last surviving field marshal from World War I, and Hitler was only too happy to use his popularity for propaganda purposes. At first, Hitler’s rearmament policy appeared to correspond with the military leadership’s desire to see a revision of certain provisions of the Versailles Treaty and his chancellorship was thus welcomed. Soon enough, however, Blomberg, Fritsch, and other members of the military elite came to realize that they, too, could easily fall victim to Hitler’s totalitarian style of leadership.